The Prefect Travel Makeup Kit on sale! Oh girl, Sephora is on sale! And don’t you deserve some new make up since you lost your favorite lip gloss in Europe somewhere? 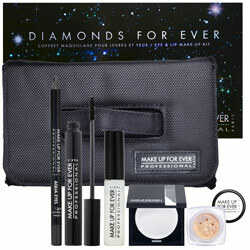 Well, this week, their limited-edition makeup kit that sparkles with diamond-infused hues is up for the taking. Shine like a jet set diamond when you use this kit that offers endless options for creating a glamorous multi-faceted look. It includes best-selling Make Up For Ever Aqua Eyes and Diamond Shadow, the new must-have Diamond Powder hue Champagne and an essential black mascara and transparent lip gloss. – A .20 fl oz Fascinating Lip Gloss in 1(pearly transparent). It’s a $110 value kit on sale for $49! Buy it here.